The Los Sueños Triple Crown is Costa Rica bill fishing’s most prestigious tournament. Here is how our resident fishing expert Justin DeBoom ended up on the 2019 winning team. As the fishing expert for the Namu Travel Group, I get a lot of opportunities to fish in Costa Rica. But 2019 may become one of my favorite fishing years ever. After the Pescadora Billfish Championship, a friend called asking if I could fish the 3rd leg of the 2019 Los Sueños Triple Crown. This was a huge opportunity as the friend in question, Dave Mothershead, is the captain of Uno Mas, a 60’ Bayless and part of the famed Uno Mas Sportfishing team. They are one of the best bill fishing teams on the water today. My first practice day with the crew was exciting and a little nerve-wracking. I was with some of the best anglers out there and felt out of my league. But everyone welcomed me with open arms, even though I made mistakes and missed fish during practice. As the rest of our team arrived that week, we kept on practicing. The team ran like a well-oiled machine. It comprised four (Terry Robinson, Sam Peters, Matt Traber and the pro Jeremy) of the best circle-hook anglers on the water today plus me! Our fearless leader was Captain/Owner Brooks Smith at the helm, with Captain Dave Mothershead working the teasers, our mates Shawn and Eric in the pit, and our tower man Jeremy. I was fishing with legends and took every opportunity to learn and ask questions until tournament time. One of 47 boats, we left the dock, and I felt nervous, excited and sick to my stomach. I couldn’t believe this was happening. Over the years, I’ve fished a few tournaments, but the Triple Crown is by far the biggest and most prestigious. Lines in were at 8:00 am, and as we all settled into our spots and watched the spread, the radio went off. As our competitors caught marlin and sailfish all around us, the first 15 minutes were an eternity. Then we got a bite. We didn’t expect that, but once the fish jumped, the excitement in the cockpit skyrocketed. After the release, the day was perfect. We had steady action throughout the day with a final tally of one blue marlin and 16 sailfish. The lines out call came out over the radio followed by the days recap. 361 Sailfish and 12 blue marlin released. That’s when we realized, we’d won the daily for day one. Back at the dock, Jimmy from Jimmy T’s Provisions was waiting at our slip with the coveted winners platter. Along with cameras and friends, day one was a day to remember. We were all on a high after winning day one and pumped up for the action ahead. Lines in at 8:00 and we settled in. Almost straight away we got a bite. Like the first one yesterday, no one saw it, but Sam, our angler on the flat, was flawless. Like yesterday the spotter yelled “marlin” and pandemonium ensued. The marlin put on a show but in a few moments we had the release. From then on the day almost mirrored day one. At lines out the competition tally was 517 sailfish and 14 marlin released. Our tally came to 16 sailfish and 1 blue marlin. Pez Collector won the day with 21 sailfish and a marlin released, but we remained in first place for the total tally. Day 3 started out different. We all felt pumped up, but the tension was high. We had a three fish lead over the closest team – a tight margin of error. But our team functioned like a well-oiled machine and we remained confident. Like the previous days, lines in at 8:00 am and everyone else caught marlin all over. Except us. An hour passed with no fish in the spread. Then two hours and still no fish. After three hours the captain tells us to wind’em in. The spot which had been so good to us the previous days was dead, and we needed to move. We picked up and ran about 18 miles to a new spot to the north. As we set out, we heard from the bridge, that fish were being marked on the electronics, which excited us. As we trolled around, the bridge went silent. About 15 minutes later the captain told us to wind them up again. Surprising, but like all good crew, we followed orders. This time, we were making a long run. We sat in the cabin, prepared lunch, and settled in for the 30+ mile run. It felt like hours but was only about 45 minutes (when you’re doing 40 knots you cover a lot of water). We did a complete 180 from our last run in search of new water. Once there, we were all by ourselves. Everyone looked around and had this look of oh boy on their faces. Another 20 minutes pass and finally, we get the call from our spotter. There’s a fish in the spread. We are all on point and can see the fish by the left teaser. But like a bad dream, the fish just cruises around doing nothing. We couldn’t believe it. Then at 12:51 pm, we get another call and boom, a bite and hook up. At 12:56 pm we released our first sailfish of the day. We’d dropped from 1st place down to 6th. Who’d have thought the first five hours of the day would see no action? But the fishing gods favored us. By 10 minutes to lines out, we’d released 8 sailfish and were back in the lead. We had Big Oh and Hey Chama in 2nd and 3rd place, tied on time with one fish behind us. Those final 10 minutes took forever. Every one of us was on point. Our senses were on high alert and we were ready to capitalize on any fish that showed up in our spread. The minutes seemed like hours and the radio kept sounding off. We were all listening to the release names hoping not to hear Hey Chama or Big Oh’s name called over the radio. Two minutes to go and we were still in first. We felt sick to our stomachs praying we could hold on. Finally, the radio called lines out and reality set in. 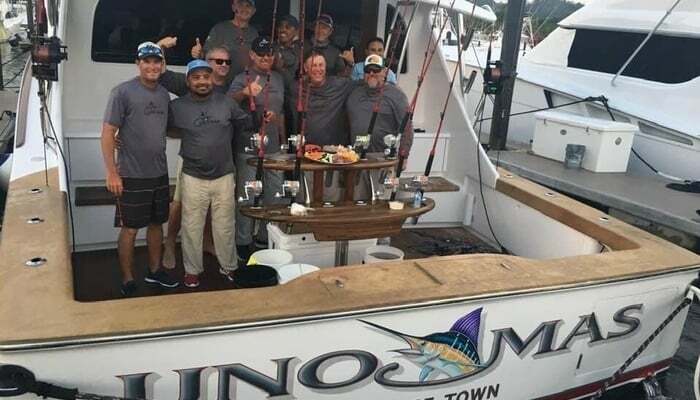 Team Uno Mas had won the 3rd leg of the 2019 Los Sueños Triple Crown. The Day 3 tally finished up with 318 sailfish and 12 blue marlin released. The 2019 Los Sueños Triple Crown released 1,196 sailfish and 38 marlin between 47 boats in three days. That’s an average of 26 billfish per boat. Goes to show why anglers call Costa Rica the billfish capital of the world. The celebration started, but remembering how our day started humbled us. The day might have been different given how late in the day we caught our first fish. But we pulled it off. As the back-up angler, I couldn’t believe what I’d experienced, and I walked away humbled. As an angler, I have much to learn and I value everything this amazing crew taught and showed me. The friendships I made during this tournament will last a lifetime. I can’t wait for the next opportunity to fish with such an extraordinary bunch of people.